Jessica Neale’s faith is lost the day of her husband’s death, and with it, her belief in love. In a journey to find peace, she encounters a gentle, green-eyed stranger who leads her to the ruins of the medieval castle, Gallimore. On his way to battle, Colwyn Haukswyrth, knight of Gallimore, comes face to face with a storm the likes of which he’s never seen, and a woman in the midst of it who claims to live centuries in the future. The Lady Jessica of Neale is an irksome, provoking bit of woman to be sure. And she’s about to turn his beliefs on end. The product of a family rooted in pain and evil, Colwyn has focused on naught but himself—until Jessica. To a mysterious prophecy stitched on a tapestry, through the invasion of Gallimore itself, Colwyn and Jessica are bound together by a lesson in forgiveness and love—a bond that might be strong enough to survive the grave. "Castles, battle-hardened knights, time travel and a bit of the supernatural—what’s not to love about this book? It didn’t take but a few pages to get sucked into this story. The author has an easy, readable style that draws you in from the get-go. Terrifically developed characters, spot on historical elements, and a story with a message attached. I loved it! Both Jessica and Colwyn come into this story with baggage but not so much that it bogs the reader down. It only made them more interesting and approachable. I enjoyed the supernatural elements drizzled throughout the story. It brought out the horrific nature of the villain and also a means for bringing the hero and heroine together. Beautiful, beautiful story... one of the most passionate and sensual inspirational romances I’ve ever read and so beautifully written. If you like fantasy or historical, this is a must read!" "This book was amazing! If you can't afford to buy another book then ask your library to order a copy and borrow it, but whatever you do...read this story ASAP... I was in another world the entire time I read this story and it was a fabulous experience. What an escape. I felt their emotion, all of the characters' fears, their joy, their longing for love. It was amazing. I can't say enough great things about this story. The spiritual thread was incredible, too. And the gritty themes and edgy aspects of the romance were scrumptious. The end of the story brought it full circle and concluded in one of the most satisfying endings you can imagine. Not many books leave me smiling and sighing at the end. GALLIMORE was perfectly excuted from start to finish. I saw no weaknesses whatsoever. This is being added to my best fiction of 2008 list." 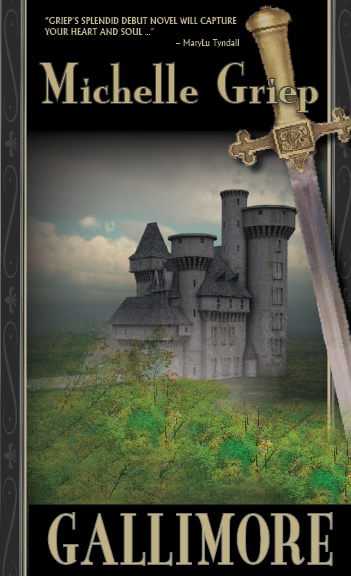 "Time travel, handsome knights, bone-chilling castles, breath-taking romance, an ominous battle between good and evil, and much more, Michelle Griep's splendid debut novel, GALLIMORE, will capture your heart and your soul and leave you begging for more." "...An historical love story with twists and turns that may leave you breathless at times, tearful at others, hopping mad, terrified and wistful." "This book is billed as historical fiction, but it is a very fine time travel tale. The author does a wonderful job of capturing a twenty first century woman’s trials and tribulations in the thirteen hundreds. Tarne and his mother are creepy, strange, and evil. I loved Colwyn, who is very strong and stoic, and his page Tagg is an engaging little boy. Jessica is a wonderfully well developed character, and I enjoyed reading about her struggles to survive and find her way home, and her reluctance to leave the man she falls in love with." "As always in a time travel, the method of travel back or forth in time can make or break a story and the manner of this time travel is reasonable and acceptable to me as a reader. There is a twist in the end as to how the heroine and her hero get together, so it makes the time travel a little more realistic. "The reader can easily become involved in the story and there is little of the fussing about chamber pots and dirt which could easily occur in time travel stories. The heroine has two issues with the past, the clothing and the lack of medical care so it was a relief not to have a whining heroine. The hero is a product of his time and keeps his thoughts to himself but we do see his sense of humor in the latter part of the story. This is a good indicator that a character is capable of change. I enjoyed reading this story." "I’ve never really liked fictionalized history. That said, I loved GALLIMORE! It’s got all the historical beauty of the stories of the Knights of the Round Table without the over-dramatization and ignorance that most modern stories set in medieval times usually take. There’s enough detail so that you really feel you’re in the period, without pushing it to the extreme like some authors do to prove they did their research. I liked that Ms. Griep was able to make you feel the emotions flying between Jessica and Colwyn without having to have them kissing all the time or feeling each other up. And the ending is great - happy without having to be perfect, because we all know that endings don’t always turn out perfect, a lesson I wish more authors would learn."